I have never seen a river with more variety among the rainbow population then the Kenai. These are all wild fish that evolved right here within the system. This is not a cookie cutter fishery. The genetics are diverse with unique characteristics from each tributary and lake all mixing together in the river during prime feeding periods. There are slim leopard bows, stout and colorful Kenai squares, steelhead like chromers, super slovenly, flesh gobbling toads, and perfectly proportioned, perfectly colored , Alaska rainbow trout. Fish range from 10” to gasp 40” with many mature fish between 24" and 28”. 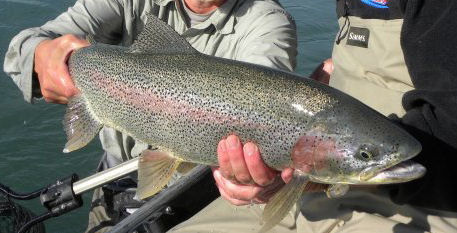 With a huge variety in fish size and technique choice for chasing Kenai Rainbows, rods from the typical 5wt trout stick to 7 and 8wt switch and spey rods have their place. My standard single hand of choice for the Kenai is a 10’ 6 or 7wt fast action rod. These rods are capable of handling 8wt floating lines and make throwing indicators or heavy steamers a reasonable prospect. They will hopefully be tested by some of the larger rainbows and likely connect with a few sockeye or silver salmon. I am a big fan of larger arbors for quick line pick up and prefer spools of approximately 4” for my 10’ rods. Backing capacity of better than 100yds is nice with a smoothly flowing drag. There are plenty of great reels out there. I feature Ross and Sage on most of my rods. We do the majority of our trout fishing with floating lines. Airflow “Ridge Supple Impact” and Rio “Grand” or “Indicator” lines are great choices. Sink tips and clear intermediate lines can be nice for throwing steamers if you have a second rod. Spey and Switch rods can work well by overlining 3 line sizes or matching them up with a suitable Skagit system. Our average leaders taper to tippets ranging from 8-12lb or 2x to 0x. The exception would be dry flies or smaller nymphs on 3x. 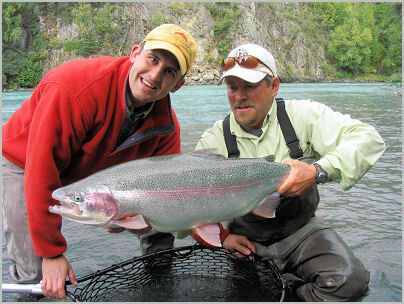 Kenai River Rainbow Trout are becoming world renowned for their size and the heavy weights they can attain. 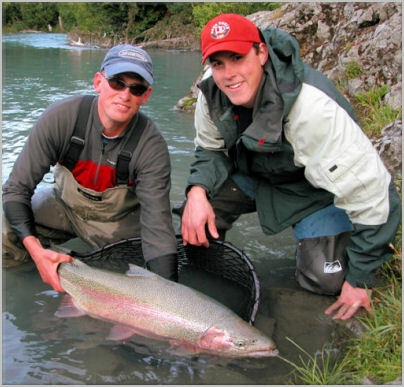 Alaska offers many trout fishing opportunities, but only a handful of rivers come close to growing rainbows to the stature attained on the Kenai River. 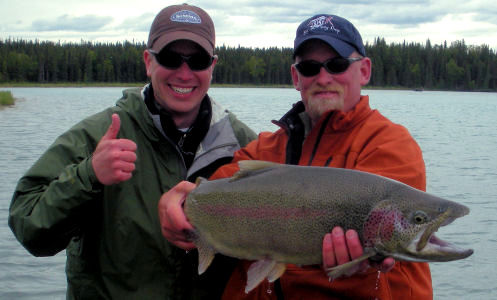 While summer and fall provide the primary angling opportunities, Kenai River Rainbows are available almost year round. A spawning closure from May through June 10 is currently in place to help protect these special fish.